Drokt's skeletal remains and his journal beside him. 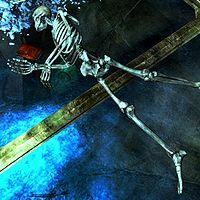 Drokt is a named skeleton, and can be found in the Tower of Mzark in Blackreach. His journal can be found near his body. His journal will inform the reader on how he became obsessed with the Oculory, and how he dies without success of aligning it correctly. If the entire journal is read, it may aid the reader on how to eventually solve the Oculory puzzle and obtain the Elder Scroll. This page was last modified on 25 December 2013, at 21:32.